To assure a high quality battery in the Cadillac ELR Plug-in Hybrid, GM's manufacturing team is using ultrasonic welding technology to build the battery pack, and an automated computer vision system for quality checks. For GM's next plug-in hybrid electric car, the Cadillac ELR, the company said today they're using an ultrasonic welding technique, for battery pack construction, that's commonly used in aerospace and medical device industries. The ultrasonic welding technique planned for the ELR is meant to ensure high quality, and is said to be a contributing factor to the eight-year/100,000-mile battery system warranty. One of the advantages of ultrasonic welding is predictable quality and performance from one battery pack to the next. Battery packs are made by joining individual cells in series and parallel configuration to implement the correct voltage and amp-hours needed for the pack. To do so, the positive and negative tabs on the cells are joined together in the correct arrangement. The Cadillac ELR battery pack has close to 200 ultrasonic welds between the tabs of individual cells. The ultrasonic welding technique also gives GM short cycle times, low capital costs and manufacturing flexibility. Battery pack assembly is done at General Motors’ Brownstown Battery Assembly plant near Detroit. 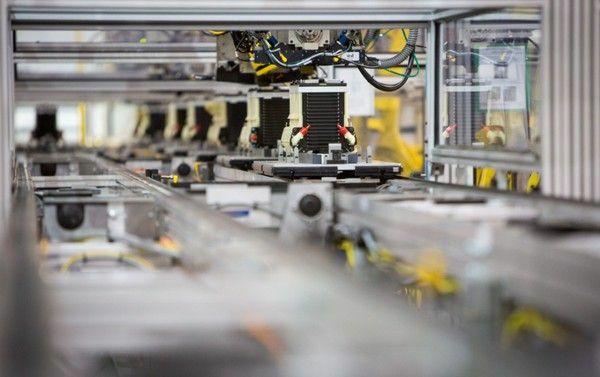 The battery assembly facility uses ultrasonic welding to join metal electrode battery cell tabs, in an automated system to execute millions of these welds each year. Ultrasonic welding uses specialized tools to apply rapid mechanical vibrations to the battery’s copper and aluminum electrodes. This creates heat through friction, resulting in a weld without requiring melting-point temperatures or joining material such as adhesives, soldering or fasteners. The battery cells could be damaged if exposed to melting-point temperatures, for example. As a quality assurance check, an integrated camera vision system shoots reference images of the weld area prior to the operation to achieve pinpoint accuracy. Electrode tabs are checked before and after welding, and the system monitors dozens of signal processing features during each weld. There's a combination of automated and manual quality checks going into each battery pack.